Dade Ellis, Simon Grimshaw, Emerson Strange, and Thomas Walker were the Fab Four of science, ushering in a new boom in scientific advancement as the research group World Corp. They changed the world and became the most celebrated scientists of all time, but somewhere along the way, it all went wrong. Welcome to the new Age of Enlightenment. Welcome to NOWHERE MEN, an all-new Image Comics series by Eric Stephenson (LONG HOT SUMMER) and Nate Bellegarde (BRIT, INVINCIBLE PRESENTS: ATOM EVE & REX SPLODE), with colors by Jordie Bellaire (THE MANHATTAN PROJECTS) and design by Fonografiks (SAGA, THE STRANGE TALENT OF LUTHER STRODE), debuting in November. 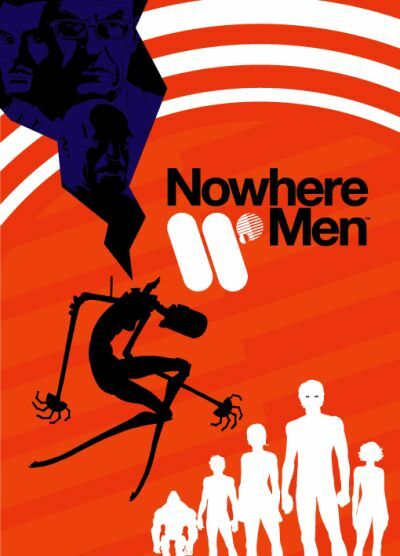 NOWHERE MEN marks Image Comics Publisher Eric Stephenson’s return to the writer’s chair to tell a story he’s been burning to write. NOWHERE MEN is brought to punk-rock pop-art life by Nate Bellegarde whose meticulously detailed style previously graced Robert Kirkman’s BRIT and INVINCIBLE PRESENTS: ATOM EVE & REX SPLODE. 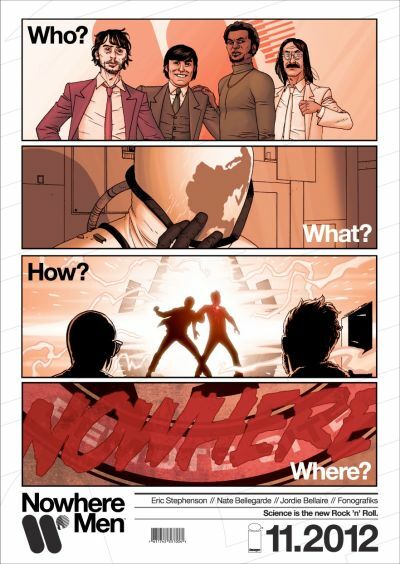 NOWHERE MEN is a full-color ongoing series making its debut on November 21. Priced at only $2.99, each issue is 32 pages and 100% advertisement-free. The first issue (SEP120393) is available for pre-order in the September issue of Previews. For anyone interested in getting a sneak peek at Stephenson’s and Bellegarde’s brave new world, check out the three-page teaser in the back of THE WALKING DEAD #102 (AUG128248), on sale now.